The Exiles of Glen Oona.”—Robert Buchanan. William Small was a Scottish artist, although he moved to London when he was about 23 years old. He gained some reputation with watercolours, and was even made an honorary member of the Royal Scottish Academy. 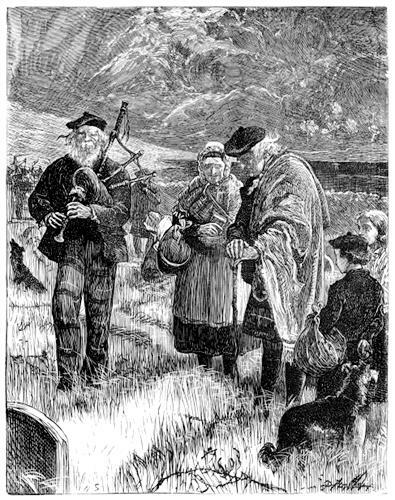 In this picture an older, bearded man plays the Scottish bagpipes for the man, woman, child and dog at the grave of the one they lost.